In the event you cannot use Softaculous to install WordPress, you can install WordPress manually by downloading the files and uploading them to your server. This tutorial will teach you how to install WordPress manually on your server. First, you will need to download the .zip file from WordPress. Once you get the WordPress files, you can upload them to your cPanel, set up the database and configure WordPress to work. Below are the steps to Install WordPress on your server manually. Go to the File Manager. Select the directory you want to install your WordPress on and click Go. Extract the WordPress zip file in the directory for your WordPress site. Note! If you extract the file, the files will go into a Wordpress folder. You will need to move the files from the WordPress folder directly to your Site document root directory. You should have the files all in the root directory like the snapshot to the right. Create a database and Database user. Add the user to the database with full permissions. Important! Save the database name, username, and database user password. You will need this in the next step. Visit your domain that you uploaded the WordPress files to. You will first see a screen asking for the default language you are using for the site. Select the language then click on Continue to proceed. Next you will see a list of the requirements for proceeding with the manual installation. 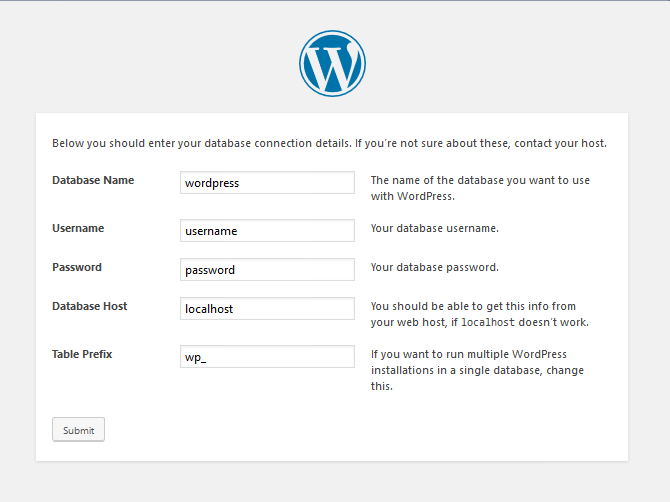 You will see that it asks for the information you used to create your WordPress database. Once you have this information, click on Let's go! Fill in each field with your database information. This information is necessary in order for WordPress to connect to the database that you have created. Click on Submit when you have completed entering the information. Next you'll see a page saying, "All right, sparky!" This basically a page to confirm that you're ready to begin the installation process to the server. Click on Run the install. Fill in the fields for the Site title, Username for the administrator, password for the administrator, and the email for the administrator. You also have a check box for Search Engine visibility that you can use to discourage search engines from indexing the site if you are still in the middle of developing the site. Click on Install WordPress when you completed filling in the fields. You will now have a Success screen pop up. You can Log into the WordPress Dashboard by clicking Log in. 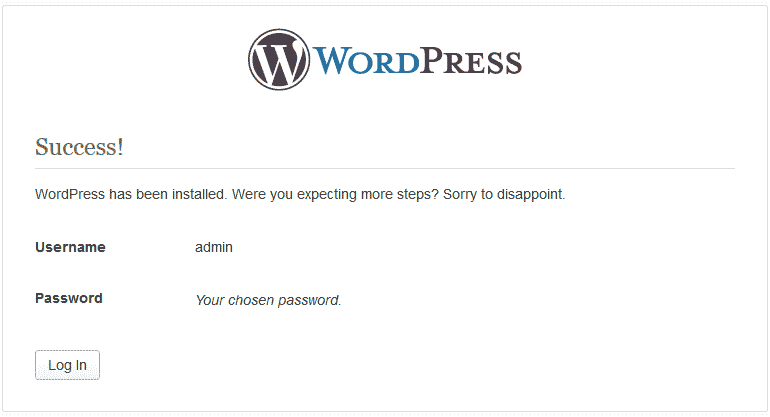 Congratulations, now you know how perform a manual installation of WordPress! I'm trying to install on a subdomain. I first tried with softuculucious (sorry- spelling) and while the installation was successful, there was no user/pass login page, only one theme available, and no way to add new themes or plugins! Now I'm trying to do it manually. First of all, where is the 'Go' button that I'm supposed to click on? The "Let's Go" button is displayed on the domain, once you have properly uploaded the WordPress installation files. Have you already uploaded the necessary files to your subdomain's directory? First of all it's way outdated. We're on WP 4.01 now. Also, there is no mention about folder and file permissions. I am having extreme difficulty uploading and configuring Wordpress 4.01 manually because I keep getting Error 500 Internal Server messages. It doesn't even matter if it's a completely fresh installation of Wordpress...with NO plugins, NO themes (except default). Your site is locked down tight and the slightest permission error triggers Error 500, so tell us exactly, what FILE PERMISSIONS do we need to set. As a newbie, I have to say these instructions were nothing but a setup for hair pull and failure. There are about 20 steps missing. Had I not had someone over the phone walk me through this step-by-step, I NEVER would have succeeded with these instructions. Without going further, I suggest you take someone who knows nothing about websites, sit down with them and write instructions from there. BTW, WordPress is at 4.0 now. We are sorry to hear that these instructions gave you a bit of a time. I hear your suggestion about taking someone with no knowledge and seeing how they do. In fact, I have just the person in mind and will do what just that. Hopefully next time you visit this article it will be updated and much easier to follow! You do not want to see anything at wp-config.php, however it should just show a blank screen if you go there and not a 404. 404 errors mean that the file does not exist. Have you tried just going to your domain name only? http://example.com for instance? If you do not see the site as it should show then you will want to remove the files and repeat the process. Alternatively you can install one of the versions using the Softaculous installer tool if that works for you.